Total relaxation at Cerulean Villa is as simple as choosing a luxurious treatment from our menu of spa services. Take treatments in our dedicated spa room, from the comfort of your own room or outside amid the soothing sounds of the ocean and gentle tradewinds. Choose from a menu of services including five types of massage, body wraps, Carita Facials, nail services and fitness options with our professional staff. The Cerulean á la Carte option allows guests to enjoy any services as they wish, with standard rates added to their final bill. The Cerulean Experience option includes 30 prepaid hours of spa treatments that can be used by anyone in your party. 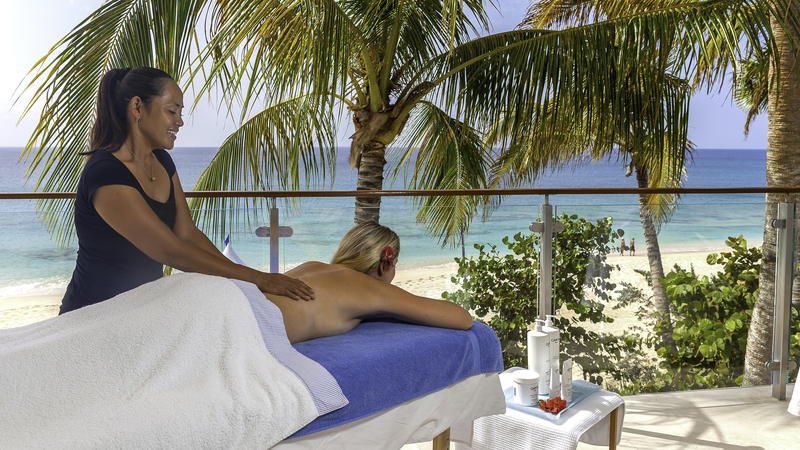 Go ahead, have a Swedish Massage in paradise! Visit our rates and amenities page for complete details. Explore therapeutic Swedish technique, deep-tissue to release hidden tension, hot-stone therapy to soothe pain and promote circulation, aromatherapy with pure essential oils and Thai massage that provides a combination of techniques to aid mobility, release blocked energy and increase flexibility. This is a partial list of massage techniques offered. Please ask if you prefer another technique. Choose a therapeutic body wrap when you’ve had a little too much sun. Or treat your body to an intensive mask treatment, nourishing the skin and gently exfoliating. Cerulean is the only villa in the Caribbean to offer official Carita facials. Indulge in the gentle, firming Radiance Facial including hands, feet and Swedish blended massage. Or choose the signature Pro Lifting Firming Face and Eye Treatment, a non-surgical facelift that provides instant results. Available for both men and women. Our qualified instructors will tailor the classes to your level and preferences. Plan a mini yoga class on the beach, fun group dance lessons on the patio, or perhaps a one-on-one fitness session in Cerulean’s private indoor gym. Professional instructors stand ready to accommodate your individual requests. Feel free to book additional treatments beyond your complimentary Cerulean Private Spa Package at our regular spa rates. Speak to our spa coordinator for more information and scheduling. Situated directly on Barnes Bay, Cerulean Villa is on the island of Anguilla, eight miles from St. Martin and approximately 230 miles from Puerto Rico on one of the Caribbean’s most breathtaking beaches. Cerulean Villa, Anguilla – a private Caribbean luxury villa rental. The premier private estate experience on Anguilla, an off-the-beaten-path tropical island with close proximity to St. Martin, St. Barts and the greater British Virgin Islands. ©2014 Cerulean Villa, Anguilla. All rights reserved. The text, graphics, images, information and all content of this site are exclusive property of Cerulean Villa, and may not be copied, displayed, transmitted, distributed, or reproduced, in any form or by any means, without the written consent of Cerulean Villa. Design by Santa Bogdon Design. Photography by Thierry Dehove Photography. Marketing, sales and management handled by Properties in Paradise, Anguilla.